Unlike the Highlander there can be more than one Dispatcher. Just because you invokeSystem.Windows.Threading.Dispatcher.CurrentDispatcher does not mean you will always get the Dispatcher responsible for executing tasks on the logical tree. // does not mean you will be given the dispatcher associated with the UI. // The lambda will never be invoked because the dispatcher retrieved is not running. As expected the UI shows the following window. And this window's text does not change. Keep a reference to the dispatcher from a known point inside the controller for your xaml. Or you can get it from any derivative of DispatcherObject (which is the root object of all Xaml components). A project I am currently working on requires us to reference a third party assembly. As is quite often the case the assembly is not exposing types that are unit testing friendly. Ideally interfaces or abstract base classes would be great, but this is seldom the case. I've been refining a strategy to consume dependencies in a indirect manner so the hard coded types don't work their way through my code essentially having a "Medusa" effect. IE: Casting all of my types into stone and then they too cannot be replaced with test mocks. Consider the schematic diagram below. The blue assembly is the Medusa assembly, wanting to cast all my types into stone. But wait I have a magic mirror shield! The External Type Factory. This is intended to control the creation of types I need to consume from the external assembly. The other issue is being able to invoke methods in the external assembly that require the hard types(Widget, Color, and Thing) as parameters. The External Type Factory has adaptor methods to unwrap my wrappers back to their original types in an indirect manner to stop the petrification effect. Stops the external hard types from preventing unit testing. Can also have life cycle management benefits - ie all calls to the assembly are managed through one area of code allowing other benefits such as life cycle management (correct instantiation and disposal) and logging. Fits well with IoC containers. Allows tossing the external dependency away and replacement with something else at a future date with little effort. A slight overhead of more code. A slight overhead of more complexity with the indirection. You still need to ensure that all developers use your factory instead of going direct and preventing unit testing. All types that want to use the external assembly need to have a factory available to them to be able to get the types. Not really usable in XAML code. I might add detail to this as I continue the journey down this path. "How do I use this, there seems to be more than one way to do anything?" Having one way to do anything can sometimes create a intuitive and easy to use API. Having only one way to do certain things obviously has trade offs in flexibility, it very much depends on the use case of your utility assembly and the consequences if consumers misuse it. My personal preference is to think about possible extensions and where functionality could be added but not necessarily expose them publically or add the extension code at all until there is a demand for them. (Demand > 1 BTW). 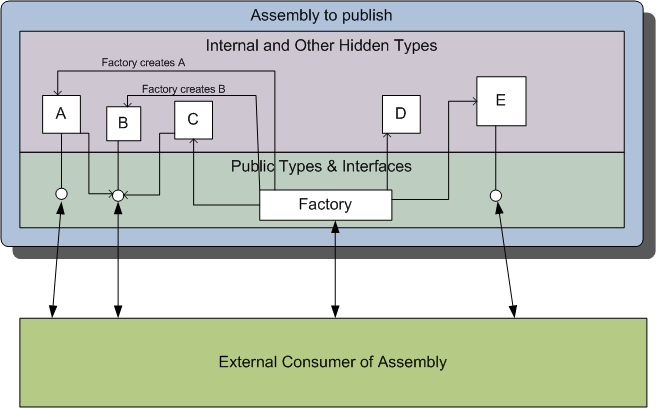 Its also worth considering implementing strict and few use cases for your assembly if its consumers are likely to be unit testing. A Test Driven Developer will want to have your babies if you are exposing nothing but interfaces and all references between objects are interfaces and creation is controlled through an interfaced factory. Not to mention that using this approach means your consumers are forced to write code that is unit testable. Enter the Factory Method Patten. Basically, using a factory, will create an object for you and return you a reference through an interface. You are not in control what exact concrete type is behind the interface nor should you care, as long as you get an instance with the right interface. The factory is also interfaced so that when it comes time to test, you can use a different factory or change its configuration to return a different type. (See IoC containers). Most types within the assembly are "internal" (ie the class is declared as internal). Each type that can be used externally are interfaced, and the interface is public. All references to other types, refer to the other type using an interface. For example type C and type A both have a reference to type B, but instead of referencing B directly they reference an interface of B. The Factory is responsible for creating types and returning a reference to an interface. The factory itself also implements an interface to allow the entire Assembly to be replaced with a complete set of test Mocks. The protected assembly in this example is the "InterfaceIntoAssembly" namespace. // Provided for testing (alternatively could be constructor argument). This code is from a Console application that consumes the InterfaceIntoAssembly.DLL. 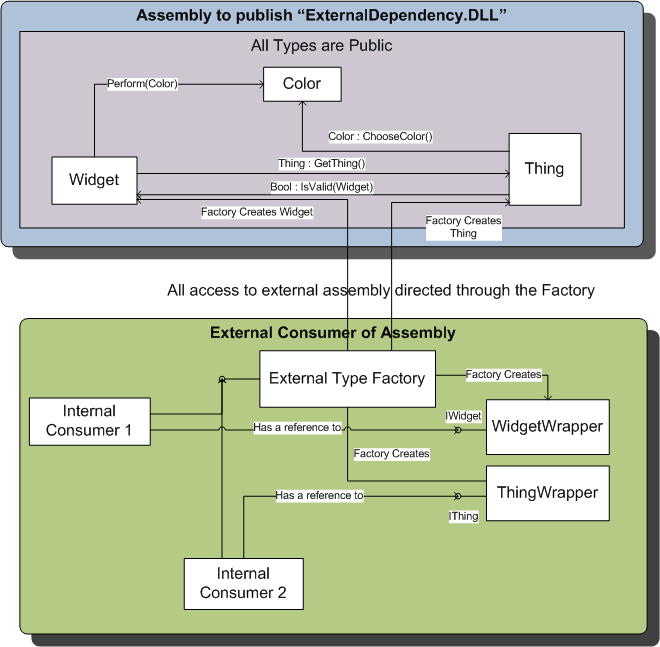 So to relate to the diagram above this code is from the "External Consumer of Assembly" green box. First thing to note is that I'm using a class scoped Factory property, this is to allow a Unit Test to create this class in test mode, and then inject a mocked Test Factory into the Factory property. I prefer to have a property for a factory rather than pass it into the constructor of the class; although sometimes passing a factory into the constructor is necessary. You might ask why don't I just create an application wide static property and refer to the factory that way, much like using the StructureMapstatic ObjectFactory.CurrentContainer property? When you run your tests with a multi-threaded parallel runner get back to me on the use of static object factories. There are many ways to implement this, and this is the most basic. For more flexibility reach straight for StructureMap. The methods available here are the Types that you want external consumers to be able to create. So if a consuming developer needs to be able to "new-up" a class you will instead of making that class public create a method here to create it. Types that are only created internally and references are passed out of the assembly then you will not need a create method. Finally lets take a look at the connection object to round out the example. Note that all references to other classes are to interfaces, or alternatively you could use abstract class if that suits better (but remember not to put code in it that will hinder different usages like testing etc). Also note that "HiddenMember" does not appear externally outside the assembly. So from the consuming console application described above you cannot see this member. This method perhaps should be declared as internal for clarity. All interface members must be declared as public. I'm not using a IoC framework in this example, but you certainly can. However my personal preference for framework or base level assemblies to avoid excessive dependencies unless there's a strong reason to include them. This simple factory definitely does the job in this case. I'm also intending on posting another example of consuming a third party DLL that does not expose interfaces, and how to write unit testable code against such a dependency. When does this not work well? When your framework/utility assembly has types you expect consumers to inherit from. When you cannot anticipate all use cases of your framework assembly. When your target audience is very senior level developers who know exactly what they are doing and want unforeseen and creative ways to extend your assembly. (In this case you'd still interface and probably just ditch the factory gateway). When does it work well? When the consequences of misusing your assembly are severe (memory leaks, financial loss etc). When you are trying to make it very easy for consuming developers to use your API. When you know your use cases up front and can reasonably anticipate possible extensions to your DLL. When you are making extensive use of unit testing. Note to self, when you read this again and have forgotten where the source code is, you can find it here. Use of the this keyword, is very much a style thing. However there is a great deal of logic behind the recommendation to use it. Most developers have some kind of consistent style they follow, and consistency is a good thing. In my opinion following historic 'traditions' need to be occasionally challenged to ensure the science and logic behind the original recommendation is still valid. I'm sure everyone would agree that technology and methodology in the software industry is extremely fast moving. So keeping all things current make sense. The overall goal in any style convention is to consistently add value to code by narrowing the number of ways a piece of code can be interpreted. However the code should always be as readable as possible. The more readable it is, the less chance for bugs. // but what is Something2? // first letter 's' means private field. // constant or readonly static. // (Foo being the type of Something). // Something4 same as above Something2,3,5. // Could be a instance or static method. // This can only be a member method. Logically 'this' definitely adds value and is much clear than using Hungarian style prefixes. This also indicates scope as well as static versus member access. I know the code will compile without it, but increasing readability of the code and reducing ambiguity DOES reduce bugs. Using a built in language construct does make more sense than inventing a prefixing or suffixing scheme. See also Microsoft Design Guidelines. Here are some useful resources I have found reading about this topic. Code Squeeze - Companies aren't progress, people are. Code Squeeze - Intellectuals don't appreciate intelligence. This page is a organic list of links and information on SOA and SaaS. Martin Fowler's Service Layer Pattern. Intercepting mouse and keyboard events anywhere in the operating system was easier than I thought. It can all be done in C# while using the User32 SetWindowsHookEx method. A Global shortcut key solution. I have a half finished proof of concept of a keyboard and mouse hook for user presence detection as well as global hotkeys. I'll post it when I get time. See this December post for more on this topic.